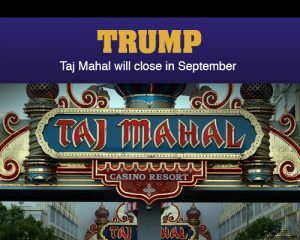 The Trump Taj Mahal, originally founded by Republican presidential candidate Donald Trump for a cost of $1 billion, announced that it will be closing its doors following Labor Day Weekend in early September. The potential closing date was pushed back several times with a hard deadline date of December 20. Two days prior to the deadline, the proprietary, billionaire Carl Icahn’s Icahn Enterprise and operated by Tropicana Enterprises, committed $20 million of much needed funds to the casino while union workers agreed to concessions. The Atlantic City casino has experienced many difficulties ever since construction began in 1983 by Resorts International, who owned the neighboring Resorts Casino Hotel. The budget at the time was set for $250 million with James Crosby, then the international chairman of Resorts International, speculating the property would likely be called the United States Hotel. The project immediately struggled with construction difficulties. When Crosby passed away in April 1986, Resorts International became a prime target for takeover with Trump beating out other bidders to acquire the company for $79 million in July 1987. At the time, Trump publicly stated he would complete the integrated casino resort in about a year after he was appointed as the chairman of Resorts International. This was not meant to be, and for a few reasons. According to Atlantic City law, Trump was prohibited from owning more than three casinos. Trump at the time already had his footprint deep in Atlantic City, operating two casinos including the Trump Plaza Hotel and Casino and Trump Marina with Resorts Casino Hotel having become his third casino property. Meanwhile in 1988, the estimated budget for completion inflated to $930 million with $550 million needed to complete the property. The threat of bankruptcy was on the horizon. After failing to secure financing, Trump offered to purchase all outstanding shares of Resorts International for $22 a share and finance the remaining construction with the caveat that he owned 100 percent of the property. This began a battle between Trump and television host and media mogul Mervyn Griffin, Jr., who offered a much more substantial $35 per share for Resorts International. After numerous lawsuits were filed between the two, a settlement was reached in November 1988 whereby Griffin acquired the Resorts International and sold the Taj Mahal to Trump for $273 million. Shortly thereafter, Trump then was able to complete the construction of the property. The doors finally opened on April 2, 1990 thanks to the raising of $650 million in junk bonds with a high 14 percent interest rate. The casino was the main attraction and probably the largest in Atlantic City with 120,000 square feet of gaming space alone, and was the highest grossing casino until 2003 when the Borgata Casino Hotel & Spa opened its doors in 2003. The casino experienced difficulties after opening, primarily due to not generating enough income to pay its creditors. This resulted in a bankruptcy agreement in 1991 whereby the junk bond holders received 50 percent of the property in exchange for lower interest rates and a longer payback period.